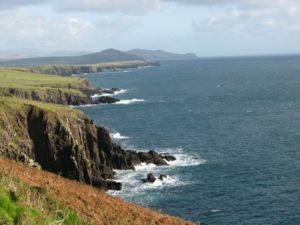 The Dingle Peninsula lays in the south- west Ireland. The edge of the peninsula called Slea Head is Europe’s most westerly point. The landscape is extremely austere, and the most outstanding feature is the lack of trees. But huge cliffs, ones of the highest in Ireland and beautiful mountains as well as the fabulous stony beaches and rich green of the pastures make up for this lack. Dingle is a small port town, beautifully located at the shore of the Atlantic and surrounded by mountains. 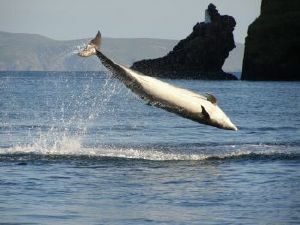 The town’s big point of interest is Fungi the Dingle dolphin who has been living in the bay’s waters for over 20 years now, showing off with impressive jumps. 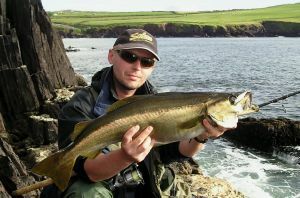 Dingle is an ideal place to catch sea bass. 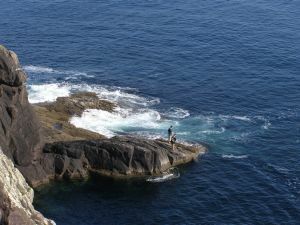 On the Dingle Peninsula, you may expect to catch pollock and sea trout. You may also count for mackerel, coalfish, garfish or wrasse. Occasionally, you may fish for mullet. When you are tired with the spinning, you may use ground sets to fish for sea devil or dogfish. At night, chances are big to catch a big conger in the Dingle harbor. If the fishing goes wrong or the weather is too bad to go angling, you may visit do some sightseeing or go to a traditional Irish pub and try a genuine Guinness. I have been fishing for nearly 30 years. For the last 20 years, I’ve been spinning nearly all the time (and occasionally fly fishing). Before I moved to Ireland, I had been a member of the spinning team of the Krosno region. I was on the podium in the region’s spinning championships many times. Four times, I won in the spinning Grand Prix of the region, I took part in Poland’s Spinning Championship four times as well. While fishing in the country, I focused on chub, barbell and brown trout. I used wobblers in the rivers of the Podkarpacie region (the Carpathian foothills).